1-11 season last fall. With a new coach in the office and a glimpse of sunlight on the horizon, the future of FAU Football is looking quite bright! With many questions for Coach Pelini and his staff regarding the plans for this program, I believe a simple list will help answer and resolve many of the conversations Owl fan's and media reporters might have. 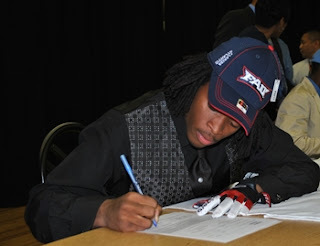 With the help of many, such as Assistant Coach and FAU Football Alum Jared Allen, Coach Pelini has brought in 28 commitments via NLI (National Letter of Intent) to the FAU program. Six of them were mid-season recruits that were brought on in January. One of the most exciting commitments is a quarterback from Pearl River Community College (Poplarville, Mississippi). The 6'3'' 195 lbs. Melvin German lll is a triple threat quarterback who looks to bring strong competition to the QB position, and not to mention some overall 'swag' that has lacked in the past. German lll completed 65% of his passes for over 2,700 yds and 17 touchdowns with only 6 interceptions last season. His size and speed will put the defense on their toes and change the game of Sun Belt play. But only time will tell, and for now we can only depend and trust in Pelini's staff that with the right training and practice, German lll will lead this Owl's team back to the top and hopefully out of the Conference. FAU Golf Drives to the Top! Baseball Season is Upon Us!